It is my favorite time of year! 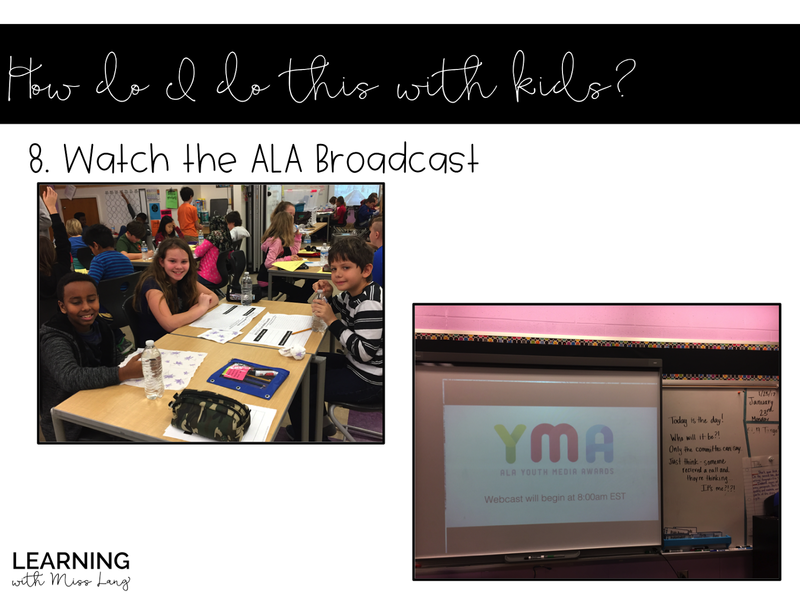 The American Library Association will present the Youth Media Awards during their mid-Winter conference on February 12th. 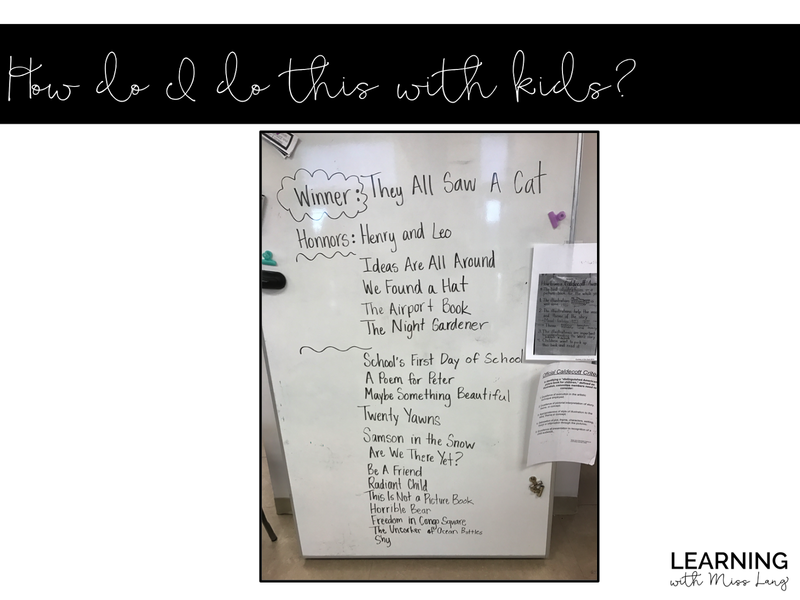 For the past few years, I've run a Mock Caldecott unit in my classroom. 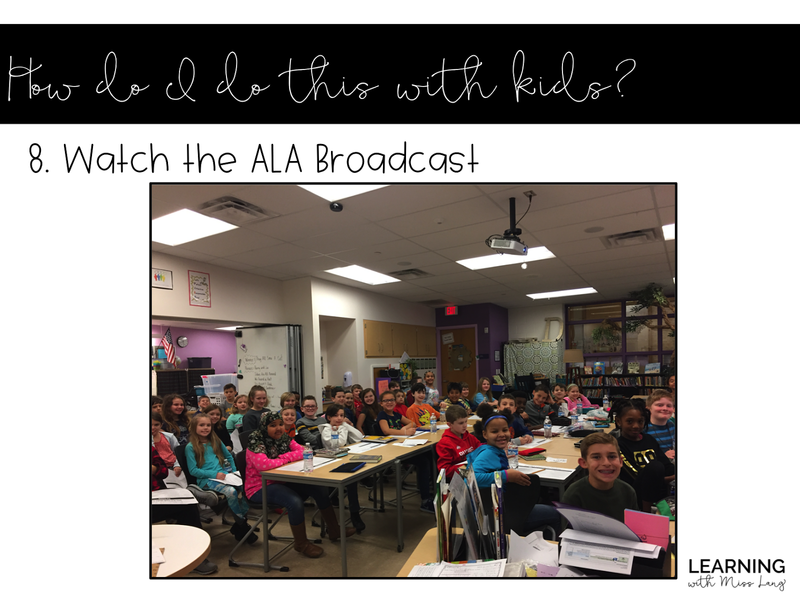 There is still time to jump in and share this wonderful experience with your class! Read on to hear about my process and some suggestions for a smooth implementation. - A committee made up of 15 librarians selects the winner and honor recipients. - The committee is unable to share any information about books they are considering. Therefore, it's a complete (and very fun!) "guessing game" in the weeks and months leading up to the announcement. - The committee has to select one Caldecott Medal winning book, but they can name as many Caldecott Honor books as they would like! Last year, there were four Honor books selected. Who knows how many there will be this year! 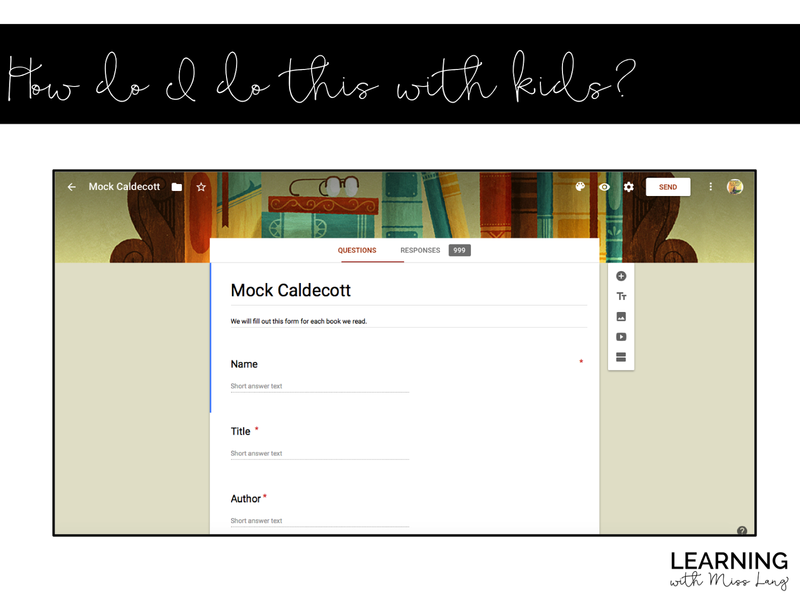 The images that follow will give you a "peek" into how I managed Mock Caldecott last year. I'm mixing it up a bit this year, but the general process is the same! 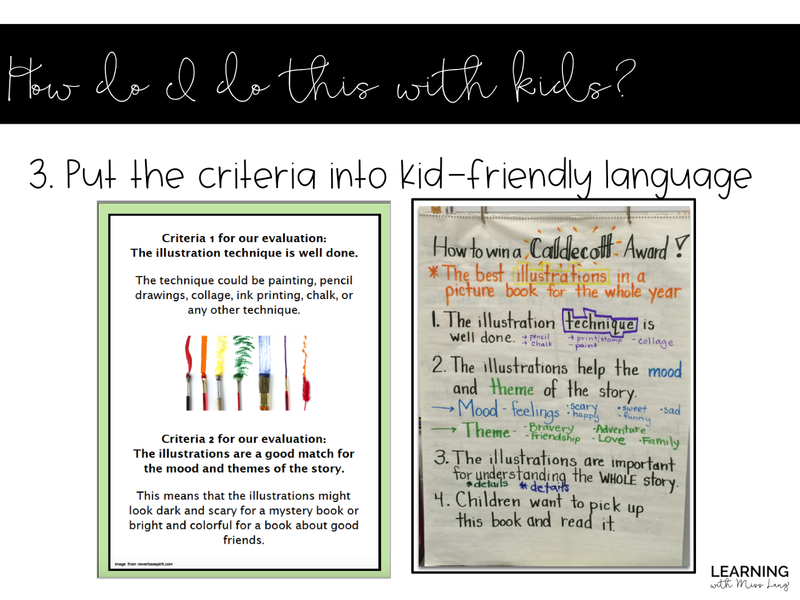 I've also linked a few sources that were incredibly helpful to me in my Mock Caldecott journey. 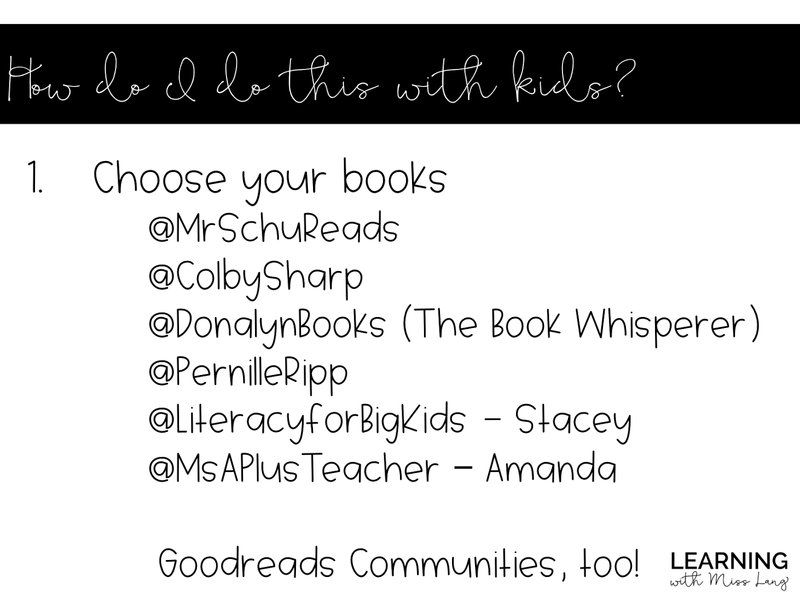 If you aren't following these outstanding educators and literacy advocates on Twitter, do so immediately! 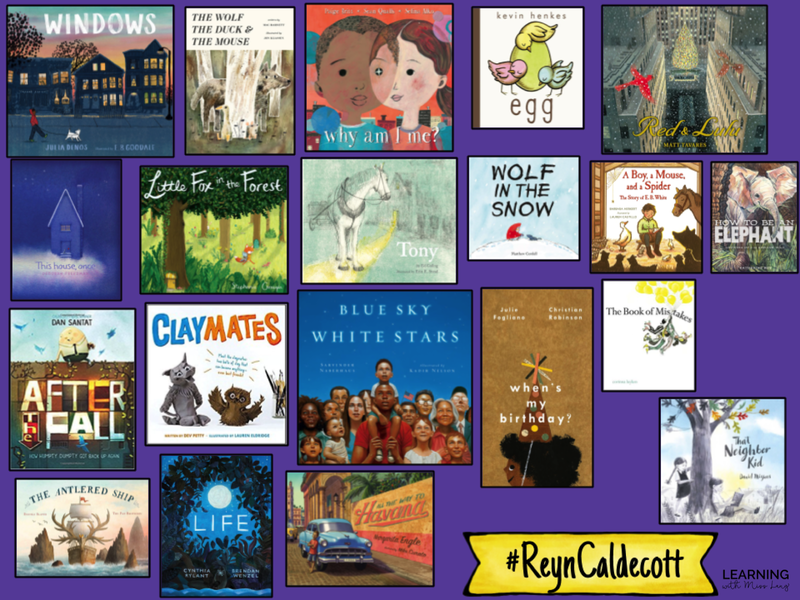 You'll start to see excellent picture books popping up throughout the year, as well as a variety of lists of books that teachers around the country are using for their own Mock Caldecott units. Colby Sharp (a 5th grade teacher in Michigan) and John Schumacher (Ambassador of School Libraries for Scholastic Book Clubs) put together a list that is very widely used. This year, I opted to use their list. 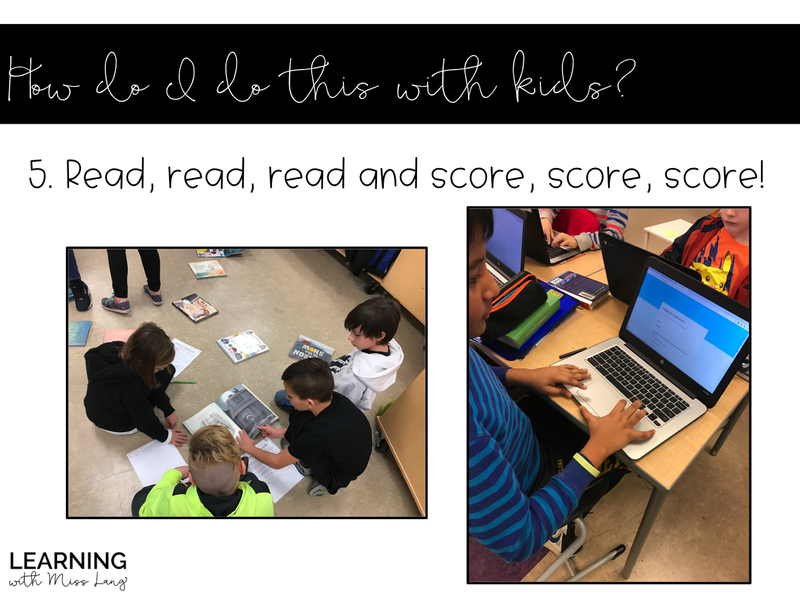 You can read more about how they selected each book on Mr. Schu's blog post linked at the end of this post! This slide is from a presentation I during a PD session for other teachers in my district - if you search #ReynCaldecott on Twitter, you'll see some more in-action shots! Obviously, your schedule is going to vary depending on how many days are left before the announcement. Make it work for you! If you need to do fewer books, do so! Remember that it isn't so much about trying to "pick the winner" as it is about analyzing author's craft and creating shared reading experiences with your class. One of my favorite things about the Mock Caldecott process is the analytical conversations that I have with my students. The more time you spend up front making sure they understand the criteria, the better off you'll be in the long run. I loved these student-friendly posters that Brian Sammons, an elementary principal, put together for his students. A link to them is also at the end of this post. I stick with four criteria and reiterate them daily throughout the unit! Jessica Lifshitz is a 5th grade teacher in Illinois. 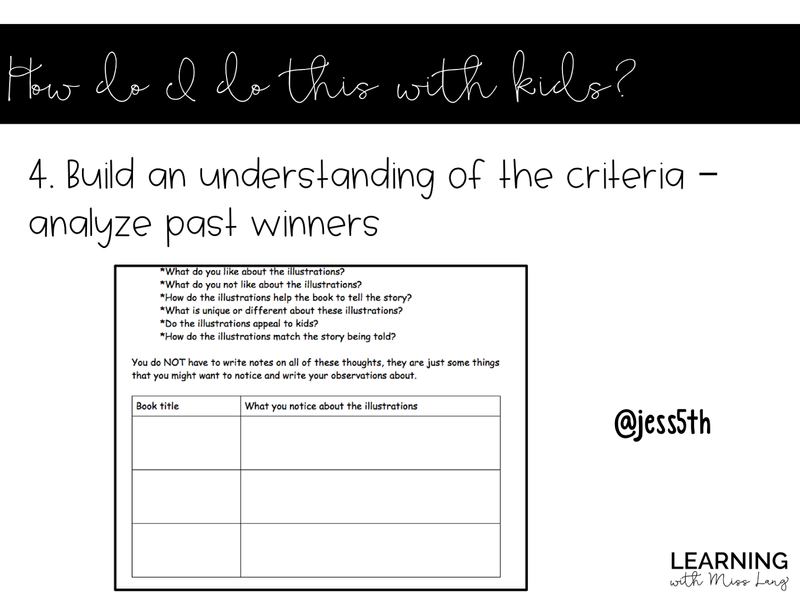 She created this activity for her students to analyze past winners and help them build an understanding of the criteria. This was a little bit complex for my third graders to do in written form, but we used these questions as discussion starters and had great conversations! The best part! 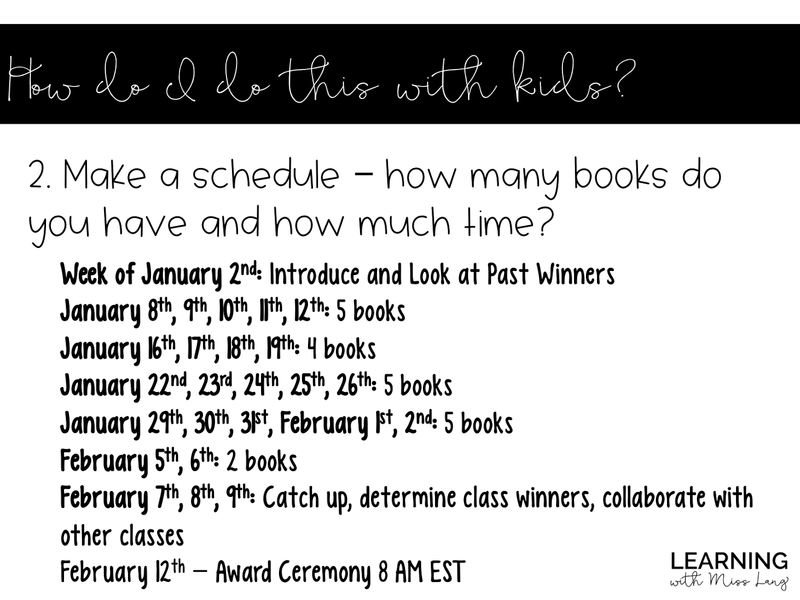 I read a book out loud each day and have a calendar posted in my classroom of what will be read on each day. The books we are considering stay out on a forward-facing shelf underneath my Smart Board throughout the unit. All of the past winners and honor books that I have are accessible on that shelf, too. Kids love flipping through the books when we have down time or they have their choice time during our reading workshop. They totally peek at the calendar, too! 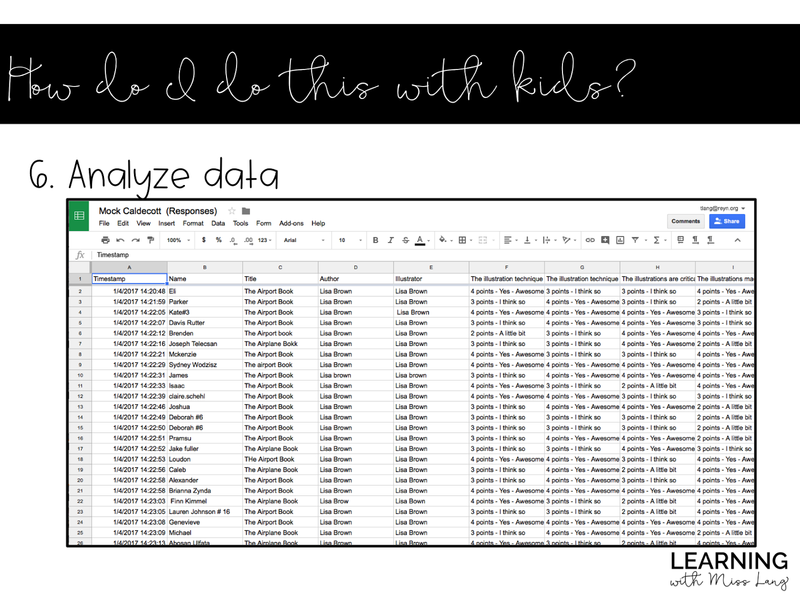 There are MANY possible ways to collect data. I am in a 1:1 Chromebook school, so we use a Google Form. On Friday, I print the data for the books that we read that week and we calculate a score for each criteria as well as an overall total. Bring on the fractions - this is a great way to integrate math! This is not my image - I found it on Pinterest and can't find the original source. If it is your school, please let me know! 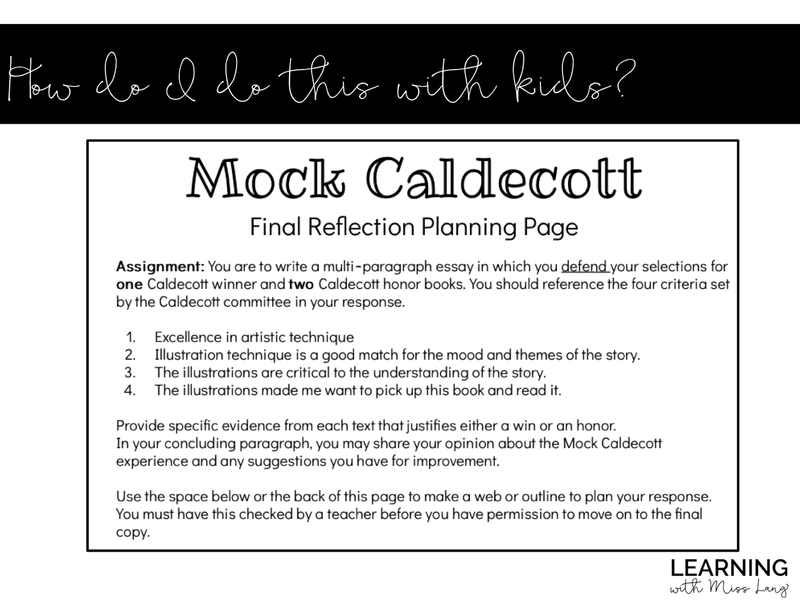 This year, I've shared the Mock Caldecott process with other teachers in the building and we have classrooms from 1st to 4th grade participating! I'm planning to hang up a similar display in our cafeteria this week. Kids in participating classes will receive colored dots - one for their winner and a different color to mark their honor books. We'll probably write grade levels on them too, so that we can have our upper grade classrooms analyze the data a little more! Once we read all of the books, we looked back at our data tracking sheets. Kids lined up, holding a book and its data sheet, in order of highest score to lowest. More math was included here as we discussed converting fractions to percents and how the denominator (a book's total possible score, based on the number of kids who were present to vote on the book) made an impact on a book's overall rating. It's hard to explain the math portion of this in writing - I will do an Instagram story on it this week! As we lined up in score order, we figured out a "cut off" for our honor awards. As I mentioned at the beginning of this post, there is not a set number of honor books - it varies each year. We just happened to predict the same number of honors as there actually were! 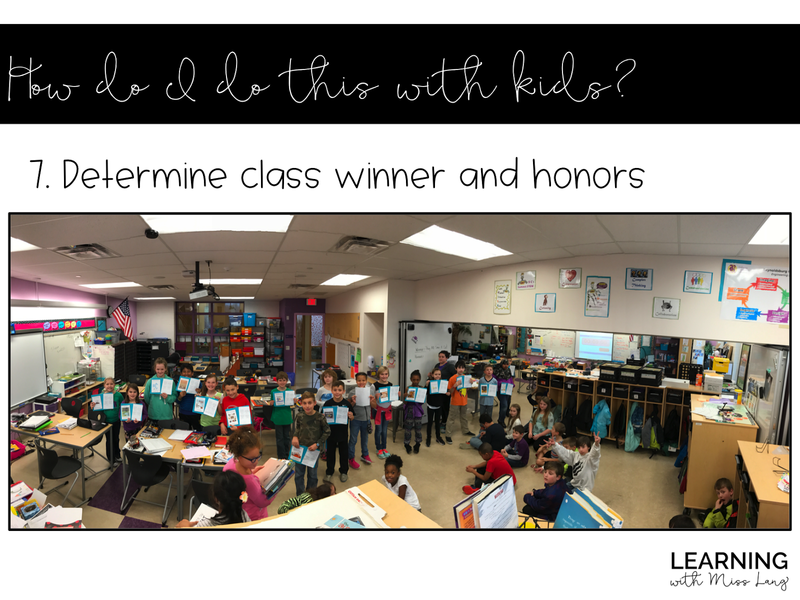 In the days leading up to the announcement, after we had selected our class winner, students wrote opinion essays on their individual selections for winner and honor books. They were SO focused during this process. You can grab this activity as a freebie in my TPT store - linked at the end of the post! The morning of the announcement, host a Breakfast with Books! We had Krispy Kreme donuts to make it even more exciting. The Youth Media Awards broadcast is a little over an hour long, with a variety of award announcements. 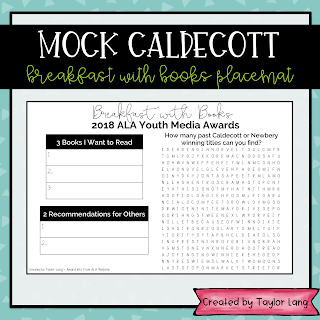 I created a Breakfast with Books placemat with puzzles and descriptions of each award. An updated placemat for 2018 is a freebie in my TPT store - link at the bottom of this post! And now... The freebies you've been waiting for! Click the images to download each resource. Here's the link to Mr. Schu's blog post. The handbook at the bottom of his post is great, too! 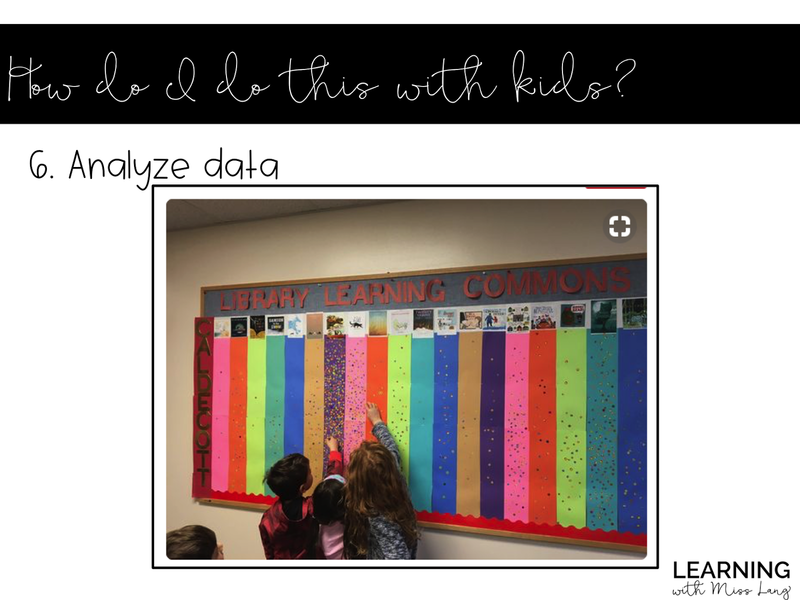 away by the thinking and conversations that my students engage in as they analyze (and LOVE!) these outstanding picture books. 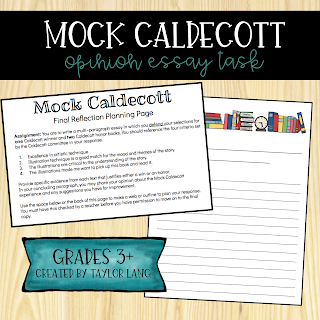 If you implement a Mock Caldecott unit, I'd love to hear all about it! Win a $10 Teachers Pay Teachers Gift Certificate! Welcome, everyone! I hope your Thanksgiving weekend was full of rest and relaxation. 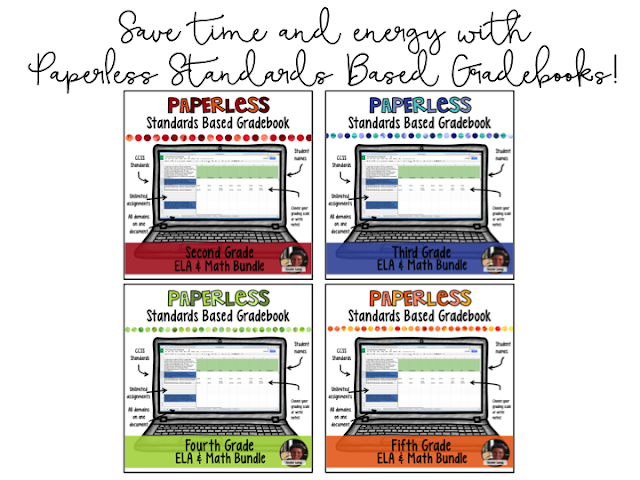 Today, I'm joining a blog hop to highlight one of my favorite TPT products and to give YOU the chance to win a $10 gift certificate to Teachers Pay Teachers. The next few weeks of school will fly by, and I'm always looking for ways to make sure I can make the most of my time in the classroom. 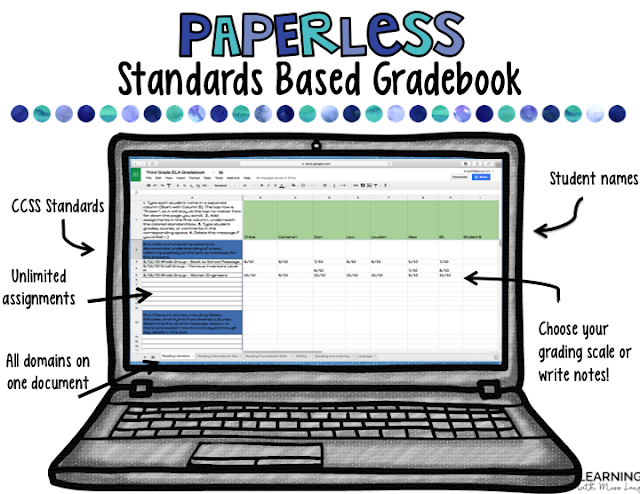 One tool that has been incredibly helpful to me in managing the paper overload is my Paperless Standards-Based Gradebook. It has space for unlimited assignments per standard, and I can choose any grading scale I'd like to use - or just enter comments! 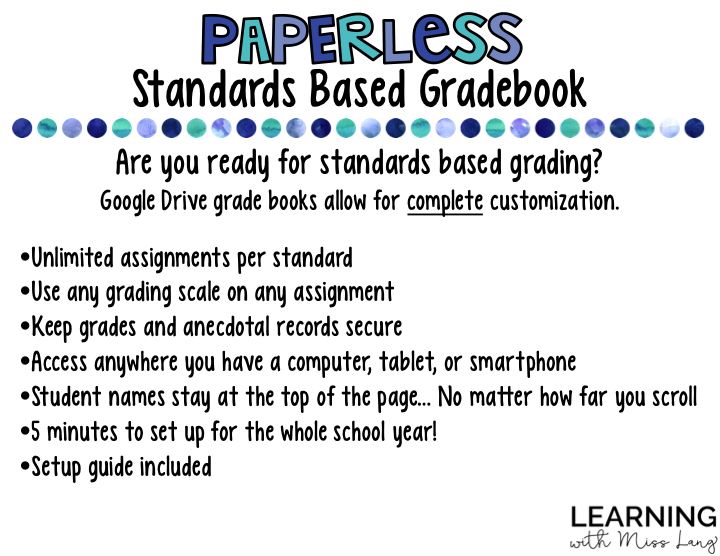 I've created Paperless Standards Based Gradebooks for grades 2, 3, 4, and 5. Click the image below to check them out! 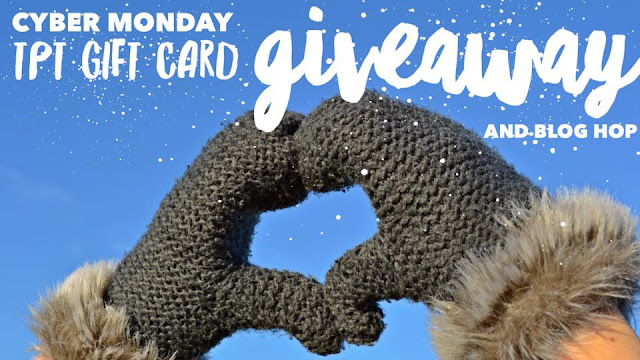 Enter the Rafflecopter below for your chance to win a $10 gift card to TPT! I will notify the winner Monday morning so that you have time to shop during the sale! 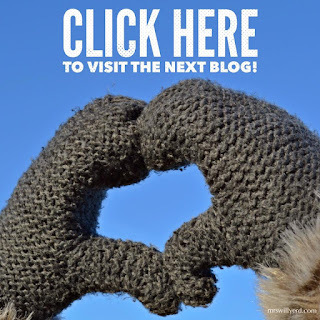 Click the image below to continue the blog hop and find another chance to win! © 2015 Learning with Miss Lang . Kiersten Template designed by Georgia Lou Studios All rights reserved. Customized by A Bird in Hand Designs.